Is Cain one part of the Crusnik family? How did Seth become the queen of the New Human Empire? Did the entire country never see her appearance before? This picture reminds me of something. I like how Abel and Cain had opposing appearances. 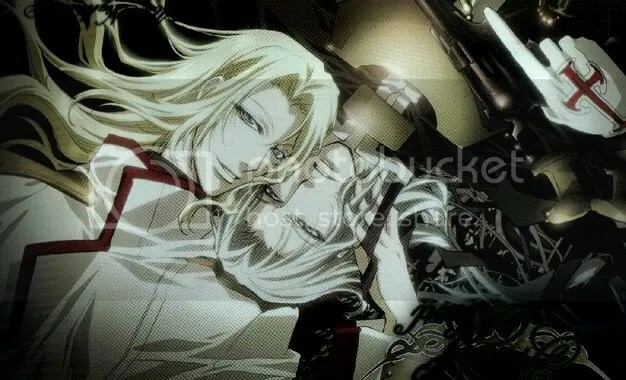 Abel’s appearance was more dark and vile-like while Cain had white clothes and a bright aura surrounding him. I’m pretty sure I can have most of these questions answered if I read the manga but I was just informed that the author of the series had died and the series is left unfinished. So, I guess reading the manga won’t have an ending but will answer majority of the questions. 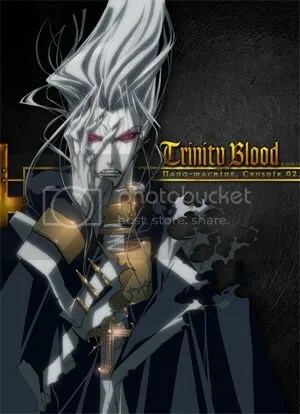 Time was essential for Trinity Blood to develop into the series it could have been but I guess there wasn’t enough time. I still don’t know much about any of the characters. Not a single character had been significantly focused on to give the audience a better understanding. As for the ending, it’s… mehh. At least we know that Esther goes on to be the queen of Albion. Judging from the ending, I assumed that Esther and Abel were romantically involved but there were only subtle hints of it and nothing obvious indicating that their relationship was more than just co-workers. There was barely any information about Rosen Kreuz Orden or about Cain. ooh well, overall it was intriguing. I like it or rather I’m content with it. Wait, would someone mind clarifying what the difference between Hellsing and Hellsing Ultimate is? This entry was posted in Anime, Currently Watching, Trinity Blood and tagged action, anime, trinity blood, vampires. Bookmark the permalink. So you stopped reading the manga or did you just put it on hold? T_T yeah, I had no idea either until my friend told me today. ooh, Are you planning on picking up on where you left off? ahah, thanks, thanks. Guess who edited it. xD ahah. ahh, you have two different icons. hmm, so you have many vampire anime qued up in your watch list? Do you like vampire animes? 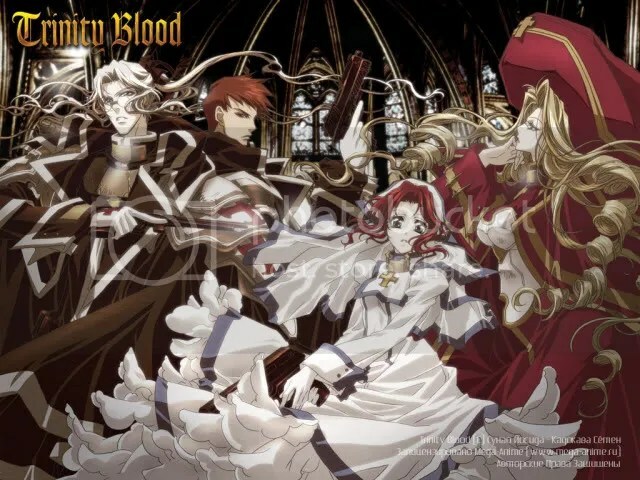 trinity blood lol i watched this… a lil bit (skipped throgh episodes alot) years ago. i have a vague image of the ending but i since i skipped so much i didn’t really get it and i was plannng to pick the manga, someday, but now that i found out that the author died… i might change my mind. Lol I watched this anime such a long time ago its been at least a year. Great anime series ive seen the whole thing 2ice. I didn’t think the end was that bad, but just for clarification was the ending that way because the author died? Is it one of your favorite? Hmm, that's a good questions but I have no idea if the author's death had any influence on the ending. D: It's got me curious now..